As you can see, I did get a chance to quilt car 2 today. It's just dawned on me I will need to give them a proper title at some point. It feels really good to have made some progress on my own quilts. Having three ready to block trim and bind is amazing. I've started thinking about the binding for the cars. I am pretty sure I want them all to be the same. I was assuming I would use a narrow traditional binding as that is what I usually put on art quilts, and using either the red or the black. As I was giving them a preliminary trim it struck me that I could go with a piped binding and get in both colours, maybe even all the white too. So folks what do you think? The original photograph I worked from for this quilt was taken by Richard Stirling, who has kindly given me permission to use a couple of his images in this series. Just as well as I haven't got many of my own the last couple of years due to helping out with Tet's car. After my talk today (Keene quilters in Essex) I was very careful to put this quilt where I could not only find it but get at it to take a picture. So I can finally show you the whole quilt that I teased you with months ago. That will teach me not to be too optimistic about when I will be able to post finished pictures. Apparently it is possible to work out who's car this is. I am surprised as I think a lot of the identity is in the sponsorship, which is not there in this image. I'll be interested to see how many people do recognise it. The next one is (I think) a lot more distinctive. I spent the last couple of days working on the pattern and preparing the applique. I am hoping I will get time to quilt it tomorrow, but we shall see. I will get to empty my car tomorrow after a week of talks. It will be nice to have some space in it for a while. After that I have to get back to customer quilts so the third car in the set (which is part way thought the design phase) may have to wait a little while. I've got plans for at least four of these quilts, but I am open to suggestions of other distinctive drag racers. Other projects are also progressing. I've been fussing with book one, which is still in need of a final title (eeek). It's been using "Ferreting around" as it's working title, which is OK but not very enlightening. It's a hard decision I want the title to be easy to find if you are looking for it by theme and easily memorable. The two don't actually seem to go together at all. I suspect at some time I will be forced to make a decision, and then we will see what happens. I was just taking a break from my drawing and found these videos that might help you when working on your next quilt. First, and very close my heart, getting your borders to lie flat. Finally, for those who make folded miters on their bindings there is this interesting video. 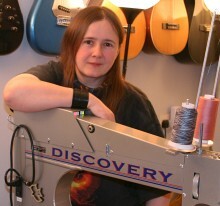 I sew mine, but this might make it possible for even me to get four good corners with folded corners. Have fun and don't get too distracted. There are a lot of quilting videos on You Tube, you could waste hours. This week has bee half term for the regular classes at Patchwork Corner. I was thinking this meant I had a week off. Well it was a nice theory, but actually I found I had booked four talks in seven days, not exactly a holiday. Still it does mean I get to meet a lot of quilters, read and drive. Just as well I enjoy driving. The driving has given me my first new insight. I listen to music on my mobile phone, it behaves much like any other MP3 player. Usually though I have stuck with listen to whole albums, it seems to me that is how the artist intended me to hear it, so that's what I do. However changing album while driving isn't easy and listening to one album on repeat for three hours at a time isn't much fun either, so I decided to listen to the tracks on random for a change. I was so surprised which tracks I really enjoyed. Some albums I haven't played for months made me smile as soon as I heard the first couple of notes. Equally some I would have said I loved were a bit lacking when heard with the rest. 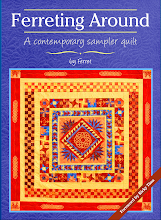 It got me thinking about how I really tick, which then leads on to the quilting again. I have managed to work on two of my quilts in between the talks. One I wanted to post yesterday is lurking in the car somewhere with the talk quilts, so I will dig it out tomorrow at the last of the four talks. The other I will keep for the Festival of quilts but it's that one that got me thinking. It's another human form, and I am loving doing it. Working on the humans is so different to anything else I do. I feel more connected to my work, more absorbed by it. Perhaps that doesn't seem odd to other people, but I find it very strange. If it were animals I would understand. Animals I can connect to, I love spending time with them, but humans I find very hard work. I would much rather be with my cats than with people, so why do the humans in quilts grab me more than the cats? I wonder if it is partly that I need to work at them more? 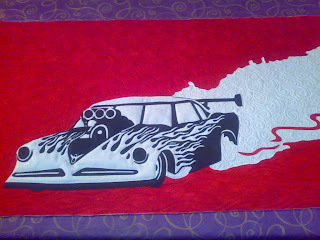 The car quilt I stitched directly before the figure, was engrossing in a different way. I didn't need to think much, I knew exactly what was where and how it should feel. It was lovely to work on, but didn't have the extra something the humans have. I don't understand why some subjects should have this sort of effect, and I wonder, does this happen to other artists? Is this a factor in how people find their style and subject matter? Just to reassure those who can't get to the Festival of Quilts in August, I will be posting a tour of my gallery there once it is up. I just want to have some work to surprise those who can make it to the show. Of course I will post some in progress pictures too. Those of you with cats have probably had them help you at some time or other. You know, the sort of help you really don't need. Well I think mine have just taken the biscuit. I've been working on a new piece and wandering about muttering magpie. I am using them as a basis for my quilt. I've been looking at so many pictures it's getting silly. I've also been watching our local ones. It seems this sudden interest has been noted (I don't normally join the cats in bird watching). A couple of days ago we thought we could smell something in the bedroom. A fairly thorough search didn't turn up anything though, and to be honest I thought I had imagined it. Today I leaned over a chest of drawers to stroke a cat and spotted.... a beak. A rather large beak... Oh lordy, a whole and quite large (and unfortunately) dead magpie. When I finally managed to retrieve it (how the heck did they get it through the cat flap) I had an audience. The cats seemed to be very pleased I had finally noticed their 'present'. I did take the chance to have a good look at where the feathers should be in the tail, the wings weren't going to spread for me. So it did help, but I would have rather observed it alive. Hopefully I can do it justice in the quilt, and I really hope the cats don't feel I need another. I've heard the saying never work with children or animals, but I haven't had cause to do either so I had no idea how true it might be. Well, I've tried it now and I don't recommend it. I have 6 cats, most of then pretty photogenic. I will admit to one who has no feline elegance and slobs around but the other s are normally pretty good. We were trying to get a new picture of me for publicity uses, this sounds simple, but believe me it isn't. I loathe having my picture taken, and well it shows. Having read up on portrait photography, part of the trick to getting a good picture is to get your subject to relax, and we figured in my case that pretty much means distracting me from the camera. Apparently I was being perfectly photogenic any moment I did think the camera could get me. "Let's use a cat as a prop." Sounds fair, cute cat, relaxed human, could work. Huh, wanna bet. Every cat suddenly became fat, stroppy and obsessed with being upside down. I really didn't feel being pictured next to a cats bottom helped. Every so often the cat seemed to realise the camera was unable to catch them and would pose perfectly, only to leap away as the shutter went. Bah and humbug. Of course today they are being perfect little darlings again, I am not trying to photograph them anymore after all. We settled on the longarm for a prop. It behaved much better and we did manage to get a usable picture. My advice, stick to machines, avoid children and animals. You know those days when you just should have stayed in bed. I knew I had to talk to a courier about a damaged shipment, but that went surprisingly well. I got someone friendly, helpful and competant. A good start. I knew I had emails to answer and paper work to do. No problem we are handling our own email, so it's been working recently. However to send it I do need to be connected to the internet don't I. Hmm, well I might be, sort of. Spotting this after working on half a dozen emails doesn't bode well, but they will probably get there eventually. Of course one of them is urgent and must arrive by tomorrow. Joy. I get a call back from the courier, a much less helpful one. Never mind, I think, I'll have a bath, the water should have been heaing for the last half hour...or not. I would give up and go out at this point but I am expecting a package. Wanna bet it turns up just after I get in the cold bath :) My cat's feel the correct answer is to go back to bed, but as I have a nice customer to go and see and a great bunch of ladies to teach tonight, I think I will stick with it. Now lets test that bath theory. This is my latest side project. Cutting kits at the shop produces lots of odd strips. 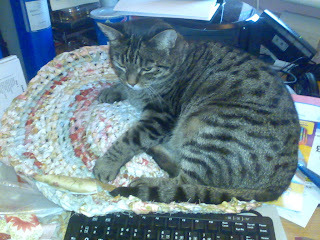 We had been thinking of kitting with them, until last week when someome mentioned rag rugs on a mail list. So last night before my class I had a go at it. My first attempt took about 15 minutes and was a bit of a dogs dinner. This is take two. I guess it's 2 or 3 hours work at most. The strips I've used aren't all the same width, I've just grabbed whatever came by, and it works. Also it's cat approved, as you can see. I don't know how much larger this one will be. I rather like the way the colours are working and I've nearly used up what I have of those colours. 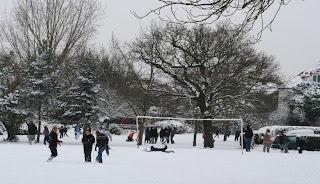 For the first time in many years we got some proper snow. 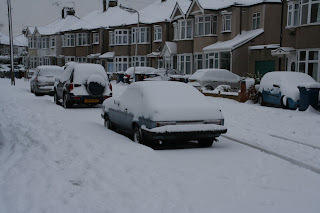 In the UK more than a dusting is treated like a crisis, so this was enough to stop London for a day. It started Sunday night, and expecting the usual half hearted attempt we went out and made the most of it. Launching hot air balloons in the snow it well worth doing, at least once. It kept snowing, and well it was a late night. I love watching it snow. Waking up to a proper covering was fantastic. I think Tet was relieved not to be riding his bike though. 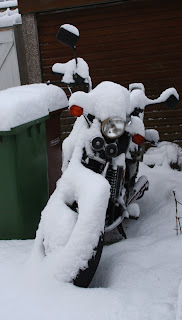 As you can see it got a thick blanket, as did the wheelie bins. Unfortunately yesterday was bin day for us, so I suspect we will have a full recycling bin for two weeks now. At least it means the dustcart didn't slide into my car. On route to the park is this very picturesque house. It's lovely any time for the year. It has plants that flower at different times and just looks wonderful. Snow apparently is no exception. Some trees are just designed to look good covered in snow. 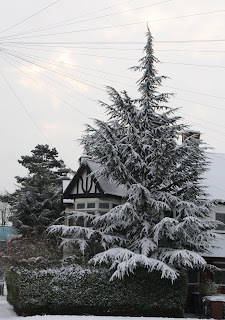 Finally I felt a snow report from Harrow wouldn't be complete without Harrow on the hill. Sorry we didn't feel like trying to get up the very slippery roads to it and when we got to a good place to see it at all it was getting pretty overcast (this was just before it started snowing again) but still. 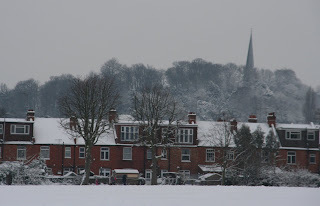 It's the famous church next to the school in the snow. The downside of the snow is it makes it very hard for me to concentrate. I have a window next to my longarm but I usually keep the curtain closed. I just had to have ti open to watch the snow. So I only managed to quilt a small quilt yesterday. Still I have the machine mostly behaving again and I can make another push on customer work today. I'd rather have more snow though. Keep your fingers crossed the forecast is right and we have more to come.